The name Tribidrag comes from the same name variety that is also the synonym with the name Kaštelanski Crljenak, worldwide known as Zinfandel (USA) or Primitivo (Italy). Tribidrag as a wine variety and wine is found in the Croatian history during the 15th century, while it enjoys royal status among Dalmatian wines. At that time Tribidrag is an established and respected wine grape variety in which enjoyed the leading Croatian writers and was also known and recognized outside Croatia. Our Tribidrag in recent Croatian history is the first Tribidrag which will be found in the Croatian and foreign market with this glorious name. Tribidrag with it label accentuates the power of this variety, which was mixed with centuries of tradition and gained fame in conjunction with today's modern vinification that gives this rich red wine. 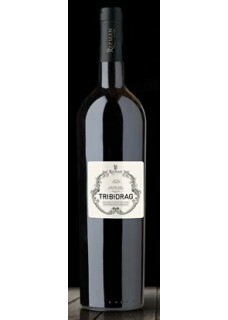 Tribidrag is made exclusively from the same name grape varieties, from our own vineyards in the micro-location of Raba, which is located on the southern and southwestern slopes up to 40%, which fall down towards the sea.e way down to the sea. This unique terroir creates the preconditions for obtaining top quality grapes. Food pairing: Roasted Fish, game, steaks, roasted beef.